Portable software is the name given to programs that firstly, do not need installing, and secondly, will run from anywhere. A portable program is often supplied as a zip archive, but it could be an executable program. If it is supplied as an executable program, it is really just a self-extracting archive that unpacks itself. The result is a folder containing the program and all the files it needs to run. That folder can be stored anywhere on the disk with read/write permission (some areas of the disk are off-limits because they are for the operating system or administrators only). A portable program can be kept in the Downloads folder for convenience and run from there using Explorer to click on the program. I created a folder C:\Users\Public\Portable and I keep all my portable programs in there. Right clicking this folder and selecting Pin to Quick Access adds it to the sidebar in Explorer to make it easy to access. When portable programs are running, right click the icon in the taskbar and select Pin to taskbar to add an icon to launch it. Portable apps are often as convenient to run as installed apps, but there are extra benefits. The whole portable program folder can be copied or moved to another computer and a thumb drive (flash memory drive) is a convenient way to transfer it. In fact, it can run from the thumb drive because it runs from anywhere, so you can carry the program in your pocket and plug it into any computer to run it. How can you tell if a program is portable? The developer will tell you. Often when you go to download a program from the developer’s website they will offer a link to download the standard version or a portable version. Sometimes it is not obvious if or where a portable version of a program is on a developer’s website and you sometimes have to hunt for it. A portable program will always run directly or extract to a folder. You then open the folder and double click the program to run it. Some websites specialise in providing portable software and PortableApps.com is one of the best, but there are others if you want to search for them. PortableApps.com does not contain every portable app, but it does contain a lot, so it is often the first place I look when searching for portable software. Is there a portable version of Office? When people talk about Office they usually mean Microsoft Office and there is not a portable version, but there are solutions as we will see in a minute. 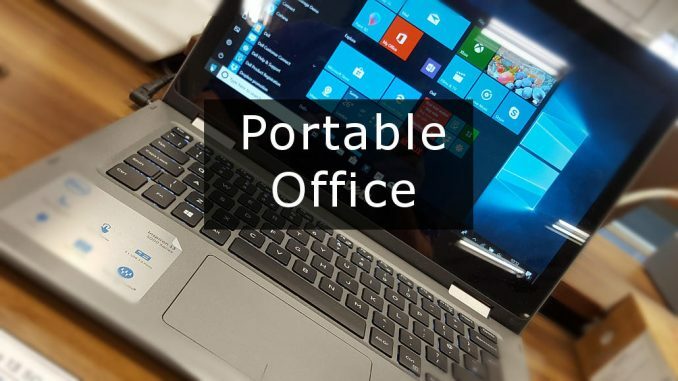 There are also alternatives to Microsoft Office and some of these office suites are indeed portable or have portable versions that can be downloaded. 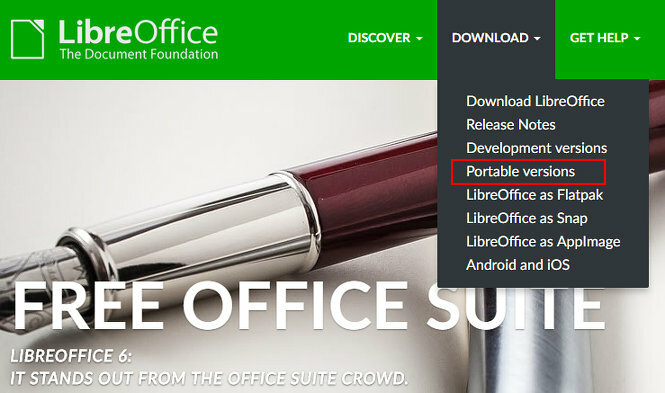 LibreOffice is one of the best known and most powerful Microsoft Office alternative and if you go to the website and click the Download menu at the top of the page, there is an option to get the portable version. It is actually packaged for them by PortableApps.com. Apache OpenOffice Portable is another alternative to Microsoft Office. It is a great office suite and both LibreOffice and Apache OpenOffice were once one program. It split into two a while back and have since taken different, but similar development paths. Some people say LibreOffice is the better of the two. Get Apache Office from PortableApps.com if you want to see what it is like. Microsoft Office itself is not portable and so it cannot be transferred to another computer. However, if you have an Office 365 Home subscription you are allowed to install MS Office on up to 5 computers – Windows PCs or Apple Macs. Check your subscription by going to OneDrive.com and clicking your name/picture in the top right corner and select My Account. Click Services and Subscriptions in the menu bar to see the details. There is also a link to install Office if you have not used up all your 5 installations. You cannot move Office but if you have unused licenses you can install extra copies on other computers. If you don’t have MS Office and want it, get it from the Microsoft website. 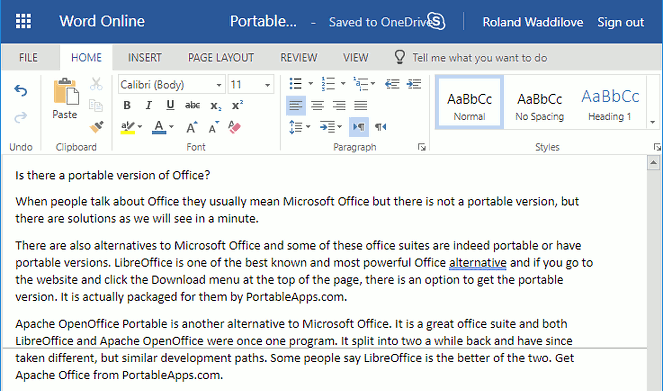 If you need to edit Office documents on another computer, an alternative to a portable version of Office is to open OneDrive in a web browser and drag the document you want to edit to the browser window to upload it if it is not already there. Click the Office file – Word, Excel, PowerPoint – to edit it within the browser using the online Office Web Apps. Here is Word Online and it is pretty good for something that runs in a web browser. The online Office apps do not have every feature of Office installed on a computer, but they have the most commonly used functions. This article is being written in the Word web app before being copied and pasted into WordPress and it works fine. The Microsoft Office apps for Android and iOS phones and tablets are truly portable in that you can carry them anywhere and use them on the go. Like the web apps at OneDrive.com they don’t have every feature, but they have the most common ones. You can, of course, mix working with the installed Office suite with working online with the web apps and working on the go on your iPhone or Android phone. They all work with OneDrive and your files are accessible everywhere.